Developer Pocket Living have launched a website and PR drive trying to drum up support after Greenwich Council’s cabinet twice signed off plans to sell public land to the private developer. Pocket Living, who have former Woolwich and Greenwich Labour MP Nick Raynesford on their board, go big on the “affordable” aspect. However, Pocket Living’s website describes a £90k salary as modest, and “affordable” here is 80% of market rates – the very highest possible and still well out of reach of many, including the nurses and teaches proponents of the scheme claim it will help. That’s not mentioned on the site. Well, not very affordable for most and a small one bed will start from at least £300,000-£400,000. And that’s for a tiny flat on the border of what’s legal in terms of size (38 square metres). Good luck with children. Not many local people could afford that, nor many key workers. Is getting people on the housing ladder a priority for a Labour council with more than 17,000 on waiting lists and ever more in expensive short term accommodation? The private sector is already being boosted by central government through various schemes to aid buyers – so why replicate that? One of the most puzzling aspects in this is Greenwich Council not considering their developer Meridian Homes to develop the land when agreeing to sell it. Meridian Homes offer homes at an “affordable” rate of 55-65% market rate – and that could have been reduced. Even if not, it’s still comfortably less than Pocket Living. Since the initial decision to sell land, central Government have also agreed to lift the borrowing cap on local authorities which hampered housebuilding. An apparent benefit of the scheme is £150,000 to be spent improving estates nearby. This raises a number of issues. One is that the authority is swimming in income from new developments which it has chosen not to spend improving many estates and neglected area. Is this now the only way they will do so? Deprive areas of improvements via S106 and CIL income and only allow investment if local residents agree to land sell offs? Abbey Wood estate is a great example. 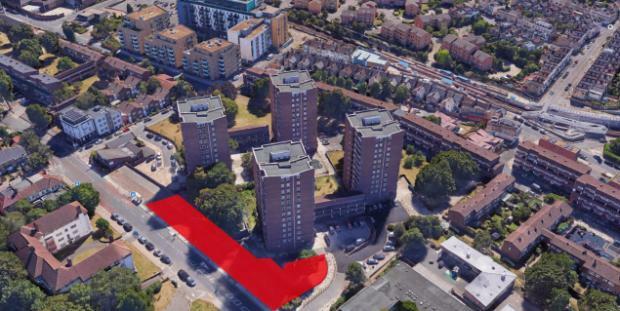 Over £1.1 million from a planned development currently with the GLA on appeal would see just £50k spent on an adjacent estate – and even that is a goodwill gesture from developers as Greenwich Council did not want to allocate a penny. £150,000 spent on estates is a tiny fraction of Section 106, Community Infrastructure Levy and New Homes Bonus income that should be spent improving deprived areas. Supporters of the scheme also claim selling public land allows money to be reinvested in council homes – but that’s only after the middle man (Pocket Living) takes their cut of profit on the scheme. Building outright,or via Meridian Homes, would permit more homes helping reduce the 17,000 waiting list and offering lower cost homes than 80% market rate. So how fair is this consultation? Local people are denied improvements unless they agree to land sell offs and a big company with large funds is encouraging people to email Greenwich council en masse to portray mass support. Their website is all sugar and gloss – all the serious side issues are ignored. A horrible decision that I find baffling for a Labour council. Other options exisit yet they seem determined to drive this through. If a lot of Labour cllrs lived a few miles south or east theyd have blue rossettes on. It seems more about power than principle. This is not Labour – new or old. I have taken part in the council’s online consultation and laid out my concerns in no uncertain terms. As ever, thanks for the excellent work in highlighting the poor decisions of, in particular, Greenwich, but also the shenangians in adjoining Lewisham. Does this mean the council building on any small bit of green they own and creating rabbit hutch houses? I really hope not – this brings down the quality of living for every one. The Royal Borough of Greenwich will use some of the money from the sale to fund the creation of council homes, helping us on our way to our target of 750 new council homes in the borough. How are you supposed to answer that question if you don’t want them to sell the land, and develop it themselves? How can it be right to phrase a question which acts as though a hypothetical scenario of selling the land is the only option available? Is this kind of question even allowed on a consultation like this? It’s clearly just set up to give them some data like ‘98% of people agree that that council should sell the land and use the money to build more council homes’. “Why could the Council not keep this land and develop it itself? That’s not an answer to the question! I answered Strongly disagree to question 10. It then gave me the opportunity to say why. This is a small piece of land and there is no reason why Greenwich could not build there itself. It’s not even as if the council couldn’t afford it stuffed as the treasury chest is with s106 receipts. It has been quite evident from the very beginning that this was a ‘done deal,’ planned some years in advance. The consultation is little more than a PR and rubber-stamping exercise. This is why the consultation questions are ‘contrived’ to manipulate the results in this manner. Similarly the copywriting regarding “local first-time buyers such as teachers and nurses, otherwise known as key workers” was only added recently, within the last few weeks. Previously there was no mention of the development being specifically for key-workers in Royal Greenwich’s communications – which it isn’t. In fact, it’s a development aimed at corporate workers in the nearby City and Canary Wharf, due to the nearby DLR station. It has nothing to do with providing homes for local people, and certainly not key-workers such as teachers and nurses – who wouldn’t even remotely be able to afford these properties.